My kids, like probably most kids out there, love Halloween. They love picking out their costumes, dressing up and going trick or treating. In this excitement they want to know how many more days until Halloween?! all the time. 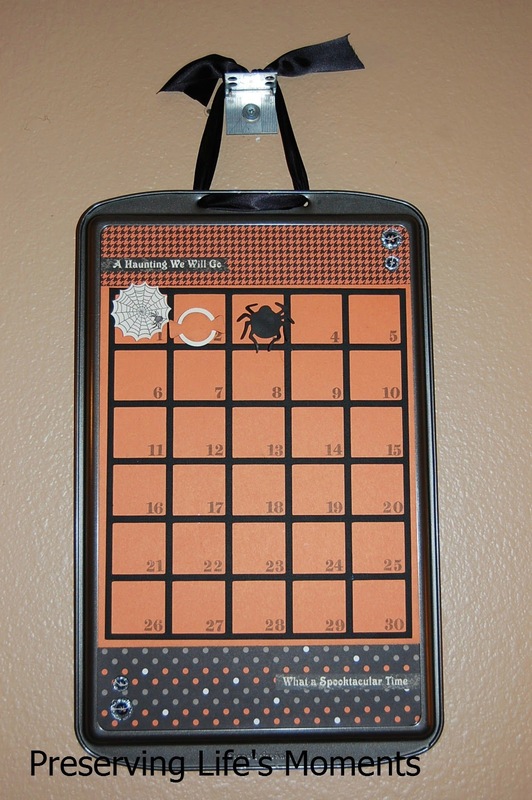 What a better way to answer this question with a Halloween countdown magnetic cookie sheet!?! couldn't wait to bring it out to show the kiddos. how it stores that way when it it isn't in use for the rest of the year. Thank goodness for my Cricut and my awesome Close To My Heart stamps. but it turns out coming up with 31 Halloween images was harder then I had expected. I big thanks to Lynette for the idea and inspiration for this project and she also used one of her Cricut cartridges to cut out the black grid for this, too. Kenny drilled two holes in the top where I threaded ribbon through it to hang it on the wall. 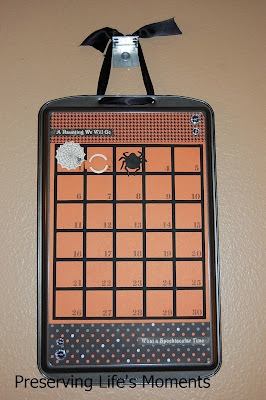 This is soo awesome and yes my kids would love this they love halloween!